Up to this point we have dealt only with 2-way speakers: we have not presented a bandpass filter of either low or high cost category. In addition we have not yet discussed the option offered by several simulation applications to accept a target curve and run an optimization loop in order to get the optimum crossover component values. The user has to set startup values for the filter components and describe the SPL target curve in a mathematical sense (which is quite easy within the software environment). We decided to elaborate on a three way project with a 10'' focal kevlar woofer, an old 5'' aerogel midrange by Audax and an old Scanspeak tweeter. We adopted 4th order filters' circuitry to start with. It uses 4 LC subcircuits to achieve 4th-order rolloff at both sides of its gain response: it can give us 4*6=24dB/oct as a highpass and a lowpass filter combination. It also contains an impedance correction RC subcircuit in parallel to the squaker (or midrange) driver. Generally speaking 3-way crossover networks need to combine three independent drivers and therefore steep SPL cutoff rates have to be achieved for the acoustic branches. In other words three way speakers generally need 4th order crossover circuitry. It is also true that in many cases not all filters need all their components. Whenever a driver exhibits a natural SPL response 6dB rolloff rate at a frequency range, the associated filter needs only be of 3rd-order, for a 4th-order acoustic branch. In this way we end up with an inductor and/or capacitor less. Again an RC impedance correction subcircuit is included. Now let us go back to the issue of automatic crossover component optimization as provided by design software. Needless to say that all driver impedances and SPL responses have to be imported to our software as measurement (usually text) files prior to any futher steps. As described before Phase Responses better be corrected by a common time delay : we suggested the tweeter's 'flight path' delay. Calsod notation will be used throughout the remaining text; similar notation is used by modern software. All three filters need to be described as RES, CAP and IND components connected to circuit nodes setting up the topologies we presented. Then we run our software isolating each driver along with its parallel RC impedance correction circuit, looking for the best R and C values. We do this for all three drivers and fix the respective RC component values which will be used till the end of the design process. We can not expect our software to proceed to filter optimization without having initial (or startup) component values entered by the user. Startup values are a major issue as will be explained. We have used values for the impedance equalization RC that best fit our Scanspeak tweeter. 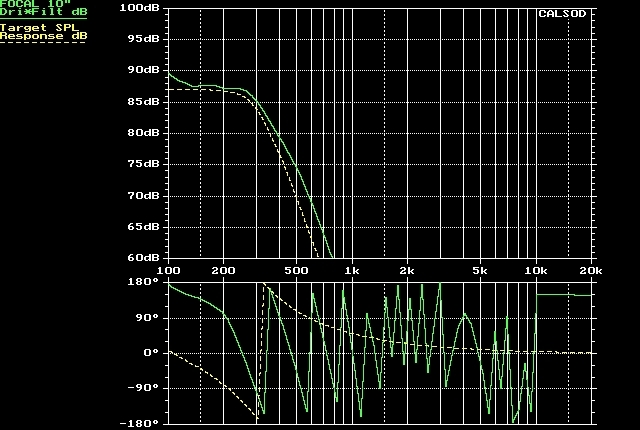 Typical chambered tweeters will need similar RC values. Then we describe our SPL response target for the HF acoustic branch in a way that our software can understand it. We describe this target SPL response as that of a '4th-order highpass system of the Butterworth family'. There are many 4th-order system families : Butterworth, Bessel Chebyshev, LaVerne Terrace, Linkwitz-Riley etc. All fourth order systems exhibit 24dB/octave rolloff rates. They all have minor differences in their shape around the cutoff frequency. We chose the Butterworth family for reasons that can not be discussed in this tutorial. 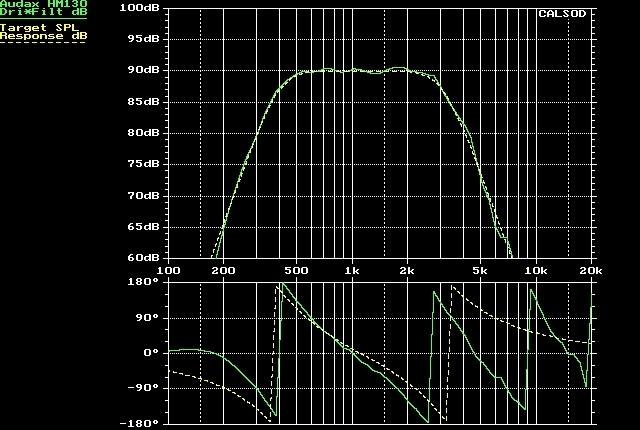 The following picture depicts both the Butterworth 4th-order HF target (yellow dashed curve) and the simulated HF acoustic branch (green solid curve) as formed by the Scanspeak tweeter and the highpass filter with our startup values. Not bad for our 'guess' component values. We instruct our software to run several times changing these component values (apart from the RC impedance equilization subcircuit) till a better match between these two curves occurs. This is the so-called optimization procedure that seeks those component values that minimize the 'error' (the average difference) between the simulated acoustic branch SPL response and user's target. Most often this automatic procedure 'converges' to a 'solution'. If our startup values are inappropriate or our mathematical target not feasible, the software will end up with a 'solution' giving poor match between these curves. Such a failure is treated easily: we change startup values drastically and if the poor match persists we change filter topology. Needless to say that target response rolloff rates (order) must match the filter's circuit order as combined to the driver's inherent rolloff. We can not ask for a 24dB/oct. rolloff rate employing 3-order filter topology and a loudspeaker that has no rolloff to offer at the target cutoff frequency. 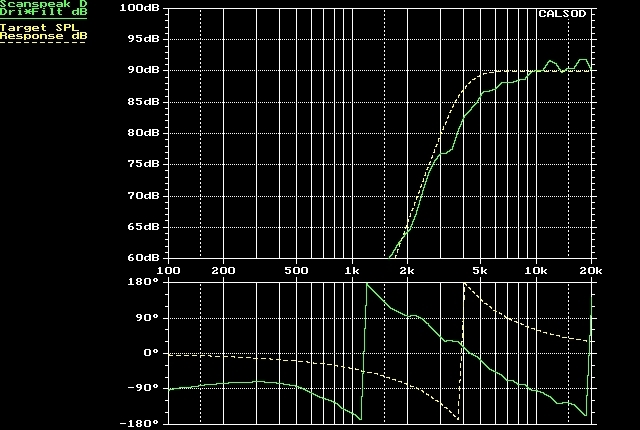 In a similar sense we can not ask for an SPL target response reaching a 90dB flat value while using a loudspeaker sensitivity of 89dB. HPF: R1=1R2, C1=5.20uF, L1=0.15mH, C2=6.10uF, L2=0.68mH (Ro=5R6/Co=1.5uF). Certainly some of these values are not available as E12 stock values and should be either truncated to a stock value or realized through a combination of stock values. In high order topologies truncation to a stock value almost always changes filter's response dramatically and thus compromises the optimization process. That is why in high order filters one has to use the second solution increasing crossover cost. Right now we only have a partial crossover network optimization focused on a single acoustic branch. Thus before making any final decisions we better wait for the overall speaker optimization that might change these values. We have used values for the impedance equalization RC that best fit our Audax 5'' midrange driver. 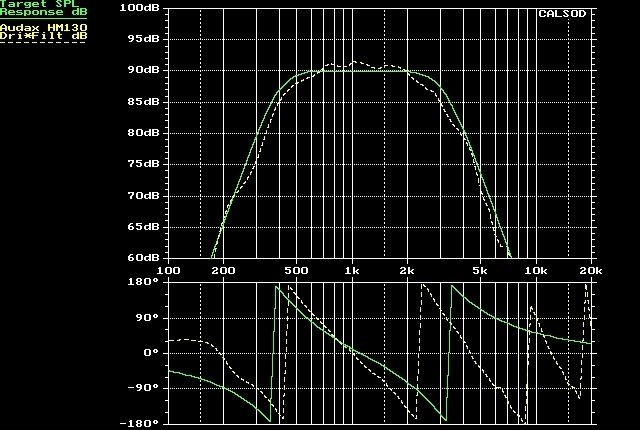 Typical midrange loudspeakers of the same diameter will need similar RC values. BPF: R1=1R5, C1=163uF, L1=0.15mH, C2=39uF, L2=0.68mH, C3=33uF, L3=0mH(! ), C4=7.7uF, L4=3.20mH, (Ro=10R/Co=6.8uF). Our software optimization instructs us to remove the L3 inductor in this filter realization! This is due to the fact that a midrange loudspeaker already furnishes a small rolloff rate around 4000Hz allowing for the filter's reduction. Before going on the LF acoustic branch we test the complex summation of the MF and HF SPL responses by asking our software to plot the overall SPL response of these two acoustic branches. If we get an almost flat SPL curve at crossover frequency range we go on. Otherwise if the summed curve exhibits a strong 'null' (dip or notch) we invert tweeter polarity. This usually straightens out the SPL response curve. If in another case the SPL dip around the crossover frequency is moderate we shift the cutoff frequency of one of the acoustic branches. Better be the HF branch for which cutoff frequency is better controlled through simple changes in the highpass filter components. Now let us see what we can do with our lowpass filter and the associated LF acoustic branch. Generally speaking controlling the shape of the SPL response of the LF acoustic branch is the most difficult task in crossover design of 3-way speaker projects. 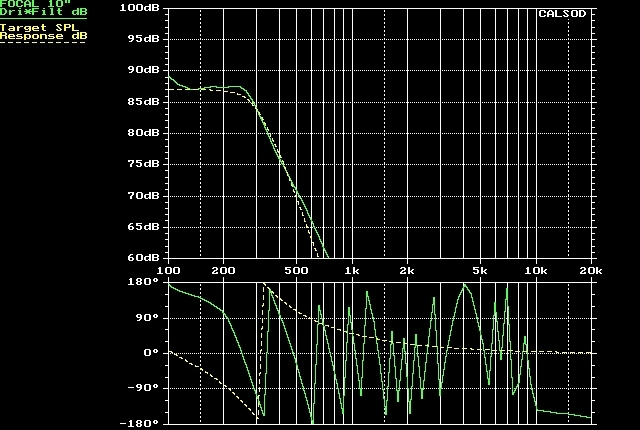 The lowpass filter cutoff frequency has to be quite low (less than 400Hz in most cases). This leads to very high values of required inductance and capacitance. 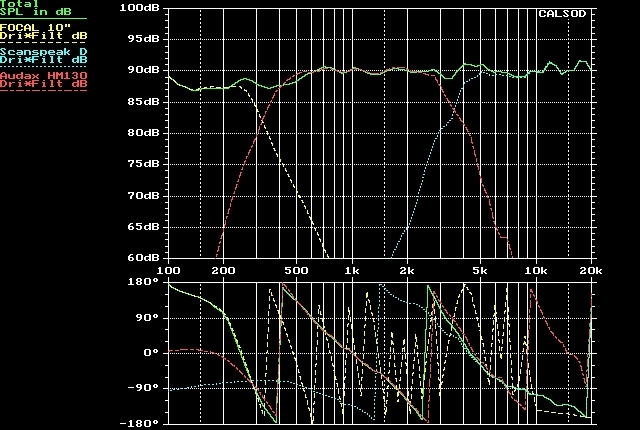 Furthermore large diameter woofers' impedance is still very complex at 200-300Hz a fact that turns out to be a burden for the lowpass filter. The highest the cutoff frequency we choose, the best performance we get from the LPF circuitry. 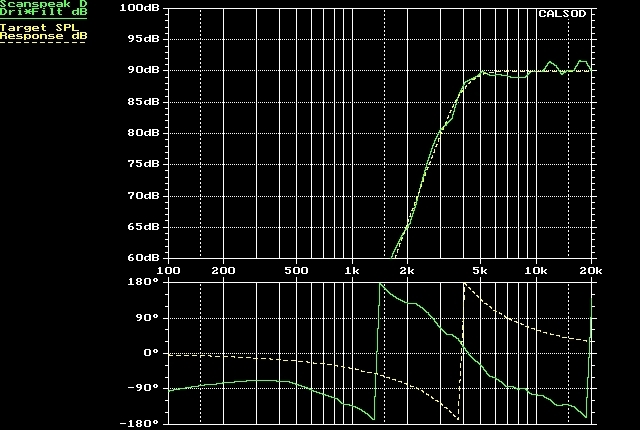 As before we have used the RC values of the optimized impedance equalization subcircuit that best treat our 10'' Focal woofer. These values highly correlate to the diameter of the voice coil and eventually to the diameter of the woofer itself. In 8'' woofers different values must be looked for from the beginning of the process. However in single woofer configuration we will rarely select an 8'' woofer for a three-way speaker project. LPF: C1=150uF, L1=5mH, C2=1uF, L2=3.3mH, (Ro=6R8/Co=44uF). It is not rare to end up with 3rd-order lowpass filter. If the optimized capacitor values can not be rounded up to the closest stock E12 values we will have to combine several capacitors. Otherwise significant SPL response deviation will occur. This is the price we pay for the use of high order filter topologies that are very sensitive to component value changes. Inductors can be ordered at custom values so they will not give us any trouble. Our final step is to check the summation of all acoustic branches, ie. the overall SPL speaker response! Woofer - Midrange - Tweeter polarities -> positive - negative - positive. Hopefully this was the last part of the crossover design for our three-way speaker example.